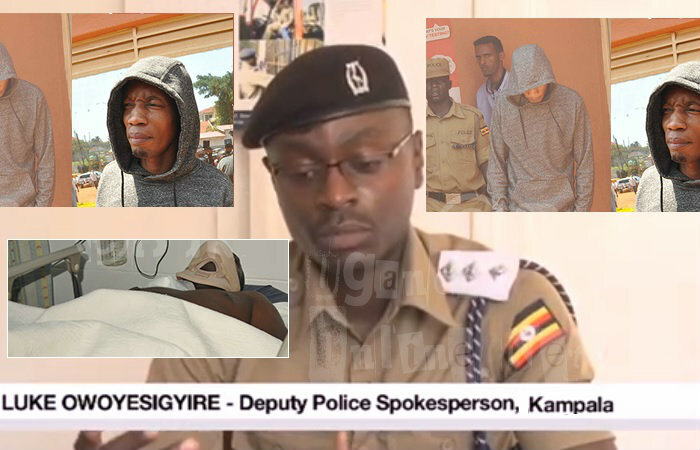 Inset is the victim, Victor at International Hospital Kampala and Brian White in a gray pullover hood at Kabalagala police station. Victor was shot at and he landed in a nearby gutter cracking his head open. "At around 2 am in the morning, Brian White was getting out of his home when he spotted Bitwire Victor and Muzoora (a private in the UPDF) driving towards his direction which is close to Brian White's home. He got out of his car and asked them why they were following him, they told him that they reside in the same area. The three exchanged bitterly, Brian lost his temper and shot one bullet in the air to scare them off by letting them know that he was armed, but they did not take any of that. It's then that he reached for his firearm and shot Victor's right collar bone, doctors say that he is responding well to treatment. Brian White is now at Kabalagala Police station charged with attempted murder and we are investigating the situation that led to this specific incident." "We also want to establish if this gun is registered or not," Deputy Police Spokesperson, Luke Owoyesigyire noted. "When people started gathering in large numbers, he rushed to his house and pulled out a Range Rover Sport UAX series and drove Victor to Nsambya hospital, he was later transferred to International Hospital Kampala," She added. In the Range Rover Sport, a policeman moved with them to the hospital and after dropping Victor at the hospital, Brian Kirumira drove to Kabalagala Police station. However, he wondered why he was being arrested for helping to take someone hurt to the hospital. Bryan White's lawyer says he will be out on police bond pretty soon.